I have been a currency collector for 7 years now and specialize on Philippine banknotes only. I have collected stamps and coins in the past but enjoy paper currency the most. I enjoy the history behind it and I like the intricate artwork, engravings, color and designs on each note. For me paper money is an exciting collectible. The value of paper money to collectors is much more than its face value printed on the paper. The study and collecting of paper money and all substitutes for money is called notaphily, whether the money is printed on paper, plastic, cloth, wood, or leather. Notaphily is to paper money collecting as numismatics is to coin collecting and philately is to stamp collecting. 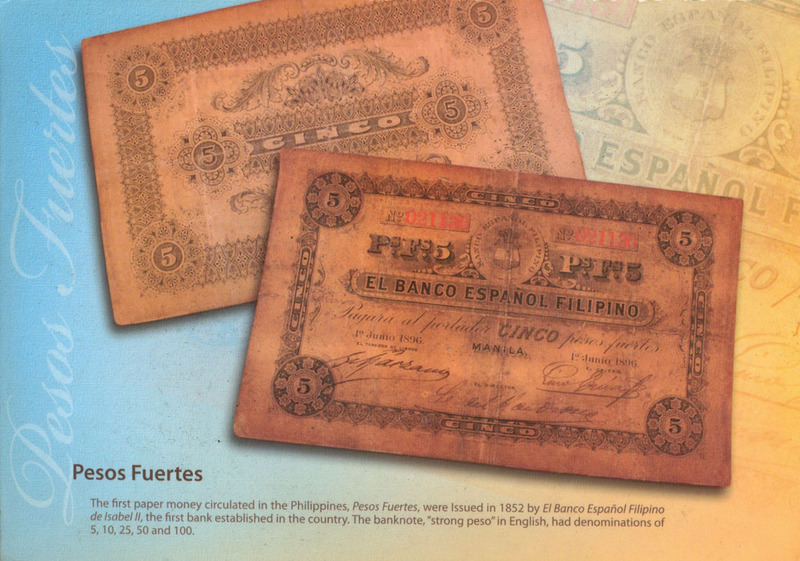 The first Philippine paper money was issued in 1852, the Banco Espanol-Filipino issued banknotes in five denominations, ranging from 5 to 100 pesos. The banknotes, in particular, resembled miniature diplomas bearing the portrait of Queen Isabela II. Her Majesty's likeness was later replaced by that of Queen Cristina's upon her ascendency. 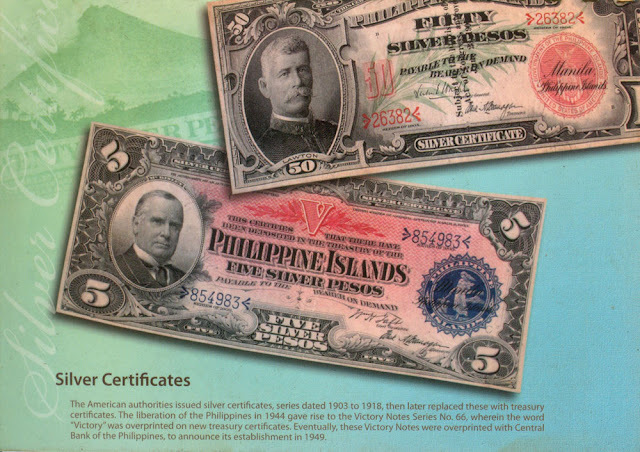 Decades later, General Emilio Aguinaldo issued several banknotes as the official currency of the ill-fared First Philippine Republic. 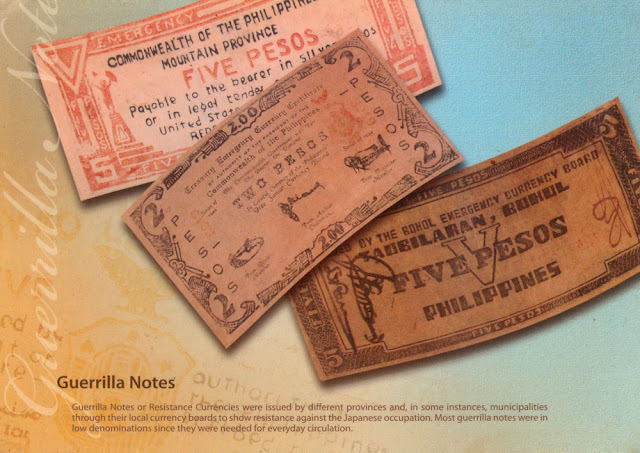 Also adorned with diploma-like designs, the Aguinaldo money circulated briefly in the Revolutionary arenas of Central Luzon. By 1903, the subsequent American administration issued silver certificates in denominations of P2, P5 and P10, each bearing a portrait of Jose Rizal. With the advent of a new foreign power, the Banco Espanol-Filipino was promptly rechristened as the Bank of the Philippine Islands. Henceforth, all monetary bills were to carry the bank's title. With the occupation of the Philippines by the Japanese Imperial forces, however, a new form of paper currency - the now infamous Mickey I Mouse money - was circulated. The superscription "The Japanese Government" on the new bills symbolically defaced the title of the Commonwealth Republic. The Liberation period, fortunately enough, liberated caches of prewar bills from obscurity by circulating them back as legal tender -with a bold yellow orange violator - the one word "Victory". In 1946 - the year the postwar Republic of the Philippines was officially born - the resurgent nation received an entirely new set of banknotes which featured for the first time a pantheon of Philippine heroes. In respective values of one, two, five, ten, twenty, fifty, one hundred, two hundred and five hundred pesos, the heroic profiles respectively of Mabini, Rizal, del Pilar, the Gomburza martyrs, Bonifacio, Jacinto, Luna, Tandang Sora, Manuel Quezon and then President Manuel Roxas gazed from one side. The other face featured historic landmarks and events such as the Barasoain Church and Magellan's landing in Cebu. After the Second World War, the old Commonwealth coinage still bearing the US superscriptions continued to be used until 1951, when the first of a series of small centavo notes were issued as replacement. 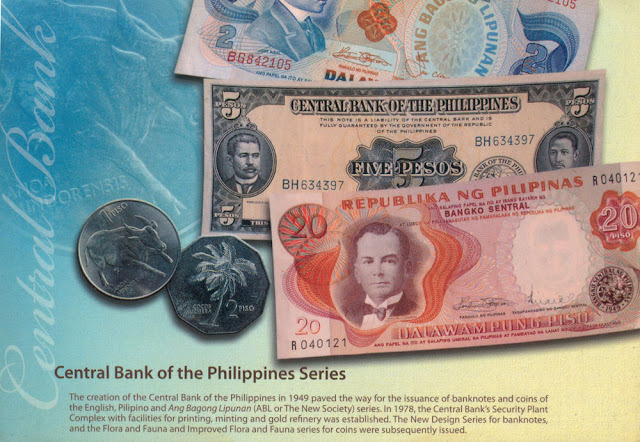 These now collectible bills are best remembered for their colors; the red-orange five centavos, the purple ten centavos, and the bluish fifty centavos. Today's bills reflect the language shift from English to Filipino first intro­duced in 1969. 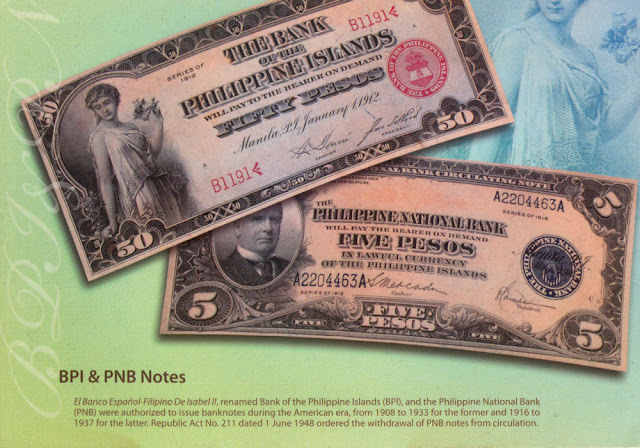 Still printed in distinctive colors, today's bills have super­seded the previously-printed blue peso notes, with a new monetary series beginning at five pesos - the same beginning amount, curiously enough, of that first batch of banknotes that over a century ago became our first paper money. One of the collection I wish to expand. Have some of old bills and coins but not complete. Hi, i have many old peso coins and old coins from other goverment pls call or txt me im selling my old coins 09460787550, wilren thanks. Tecx me or call 09123346610.i have 1peso in silver currency of the united states.series no.66.5peso1949 and 1peso 1949 peso bill. The 5 centavos is worth around 10 - 40 pesos depending on the condition and signature combination. Where is your location sir? Where can we bring the bills that we wanted to sell? and Centennial Commemorative Stamps on Wednesday, 10 October 2012 at 2:00 pm. Note: Commemorative Bills & Stamps are available for sale during the event. I collect all the Filipino pesos depicting Filipino national heroes & patriots for the Philippine independence. Thanks! Around 1000 today's market price. sirr i have a japanese philippine money i have 100,10 pesos ..
what is the price per piece? Hello! I have an old Philippine money but it's not a coin though. It's a 20 peso bill from 1949-Diosdado Macapagal as president. Would you know how much it's value is? Thank you. Hello!! I have an old philippine money but it's not a coin though. It's a 20 peso bill from 1949-Diosdado Macapagal as president.Would you know how much it's value? If you interested please contact my #09228796061.. that's all. Tnank you.. Hello!! I have an old philippine money but it's not a coin though. It's a 20 peso bill from 1949-Diosdado Macapagal as president.Would you know how much it's value? If you interested please contact my #09488756822.. that's all. Tnank you.. Proposed new currency in the Philippines is 5000 peso bill to be used in the future the year 2020-2050 Philippines the new vision of the future. Thanks! ARE YOU LOOKING FOR OLD PESO BILL PAPER? I have a 5 peso and 1 peso bill japanese government. Interested just text me09158934349. Who can help me with the names of the signatures on the 1917 emergency notes ? hi Im sharmaine i got 100 peso bill Japanese government just text me 09127308833. Hi my name is Rennelle Lara Maliksi are you interested in buying my 1949 1 Peso Bill I have two of them but the other one is vandalized how much can you offer? Tnx in the future... I'm only interested in meet ups. I'm from Silang Cavite. hello po.meron po akong 2 pesos series of 1924 ni rizal po . just text me 09301130406 if interested po kayo. I have found the infamous Mickey Mouse money in 1 peso...lots of it. I am selling it. If interested please call me at 09261939685.
hi, i have japanese peso money for sale (1, 5, 10 and 100) contact me @09329383994. txt ur intention. I am selling my 1949 paper money, two peso bill. hi I am selling a phil. old coins starting from an 1960's coin, i also have an paper money...u can send an email at simple_leizyl@yahoo.com u can also text me at 09213874687.
hi I am selling a phil. old coins starting from an 1960's coin, i also have an paper money...u can send an email at simple_leysel@yahoo.com u can also text me at 09213874687. Hi im kevin, i have world war 2 japanese goverment 10pesos 1pc. If ur interested here is my # 09264034335. Epzie03@gmail.com tnx. hi i have twenty peso bill .. 1949 diosdado macapagal president if interested please txt me ...09087339485 thx..
Hello!I hve 2 pesos paper bill(1949)hw much cn u offer?txt me 09339926932 tnx. Hi my name is Gia. I am selling my old coins and The Japanese Gov't money. hi, I have 2 piso bagong lipunan 1949, 1 piso bill 1942 series (bohol currency), 5 piso bill 1942 series (negros occ. currency),and 5 peso the Japanese government bill. if you interested just call or tx me 09328634928.
hi meron akong 5000 djibouti francs paper bill, sino interesado? 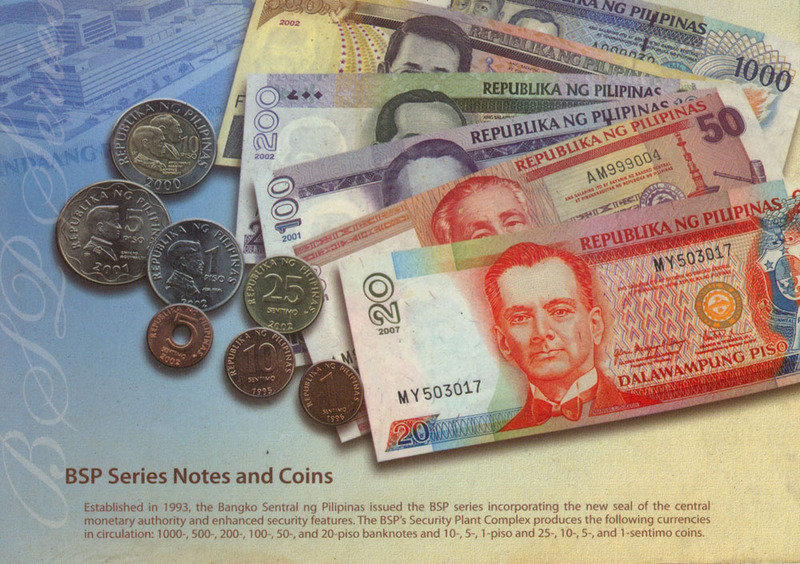 hi , im lhykz have a banknotes : denomination : 2000 - senternaryong salapi 1898-1998. w/ BSP CERTIFICATE OF ISSUANCE. PLS. CONTACT ME 0912 3396801 . Selling my 100k USD bill. hi im selling my old peso bill,1949 bank note. hello there. i got old coins, commemorative coins, stamps and bills. im selling them all. how much is the value of 2 peso bill ? Jose Rizal edition .. Who wants to buy ? Text me . Hi mr kollecktor ask ko lng magkano bili nyo ng 1906 one peso silver coins filipinas?call or txt me 09061113313 meron ako. Anu boss nakita mo image ng 1906 ko? Magkano kuha mo? Meron akong lumang paper bill ng Bagong Lipunan, magkano po ang bili? It is around 1500 pesos. magkano naman ang 5 peso bill year 1898-1901? A lot of those notes are coming out. Most that I have seen are counterfeits. hi i have a 500 peso bill with same serial number,kindly txt me if you are interested..09204008501. Please visit POBRE COLLECTOR on facebook. Plenty of currency collectibles on sale. We specializes on starnotes, solid serial notes and error bill. Who is the signatory in the notes, also what is the condition of the note? Does Philippines notes with commemorative anniversaries stamped in them have higher value than their face value? It is worth it to collect them? Yes, they have a small premium at the moment, but will they are worth keeping and prices might increase in the coming years. Hi, I have 11 pieces of the 100 Peso UP Centennial Notes. These are never been used and doesn't have a fold. I'm selling them for a friendly price. Please message me at hellokimiviajera@gmail.com when interested. Have a great day! hi:) im selling mah paper old bills like 50,20,10,5,2 peso paper bill how much could i sell it. How much could I sell per piece? If anyone's interested, please email me, delacerna.elaine@gmail.com. I'm also selling other old foreign coins and banknotes. I have paper peso billa po from Marcos Era. Anyone interested po. Here is my # 09496379909.
i have a 10 peso old bill. its in great condition, crisp, no wear or any tear. if interested just txt me 09275186325.
i got 5 peso bill (year 1898-1901) how much could i sell it? Im selling my antique silver coin 1905 s straight serif 1 us-filipinas 1 peso coin, 1922 peace coin 1 dollar, 1921 liberty coronet head 1 dollar coin. How much will you buy? Make me an offer. Anyone interested col or txt me at 0935-664-5729. Hi I'm selling rare guerilla negros occ. emergency currency 10 peso bill, price is very negotiable. Call or text me 09295272826. I have here with me 1949 25 pcs. 5 peso bill, 10 pcs. 10 peso bill and 30 pcs. 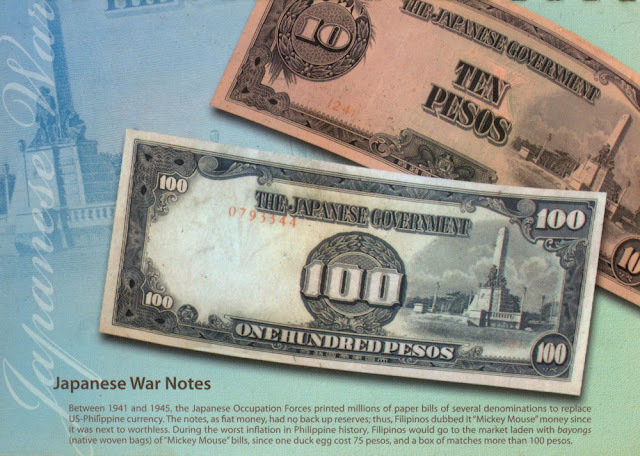 30 peso bill; The Japanese government 2 pcs. 1 peso bill, 2 pcs. 5 peso bill and 2 pcs. 10 peso bill and 1 pc. Peru 1000 Mil Soles de Oro and plenty of old coins..
Gud day I have old coin US 1 cent dated 1852..good condition..how much? i have a 5 peso bill here andres bonifacio's picture in my money . how much is the selling price of this . Goodafternoon, do you buy commemorative 5 peso bills and 2 & 10 peso bill from bagong lipunan series? 09322434698 pm in my no. i have old japanese/peso monetary. 5 peso, 10, and 2-100s.. what is the value? 1 have 5 pieces of Japanese Government money 100 peso bill ? Is this worth it to sell now ? sir i have 10/100 for japanese/peso how much did you buy per piece ? if your interested just text to my contack no..
goodeve i have a 1pc. of japanese goverment ten pesos bill message me in fb spikecruz@ymail.com in good condition what is a selling price of these?? i have 1x Two peso bill printed 1949, 1x Five peso bill printed 1949. how much would these cost? Hi. I have 1942 paper bill,emergency note.. One is bacolod 5 pesos.